More than 200 whales stranded on a remote beach in New Zealand on Saturday have refloated themselves and returned to sea. But conservation officials have warned that they could still turn back to the beach at Farewell Spit, South Island. Earlier, volunteers managed to refloat some 100 of the more than 400 pilot whales which beached on Thursday. However a human chain, with volunteers wading neck-deep into the water, failed to prevent a fresh pod making landfall. 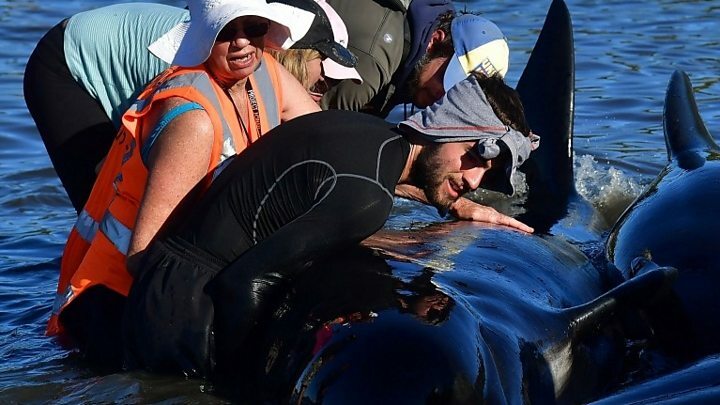 "The 240-odd whales that had stranded between Puponga and Pakawau late on Saturday have mostly refloated themselves on last night's high tide and are milling around in shallow water," conservation spokesman Herb Christophers said. Seventeen of the group which remained stranded were refloated by rescuers and volunteers who were working on the spit. The environmental group Project Jonah, which is assisting with the rescue, has a plane flying over the bay to keep track of the whales' movements. 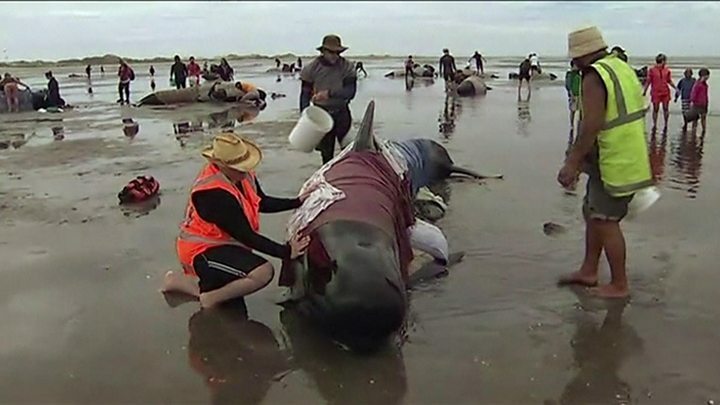 The whale stranding is one of the worst ever in New Zealand. Dozens of volunteers have turned out to help since the incident was first reported on Thursday. More than 300 of the 400 original arrivals died while medics and members of the public tried to keep survivors alive by cooling them with water. It is not clear why the pilot whales- which are technically members of the dolphin family - continue to arrive on the 5km-long (three mile-long) beach next to Golden Bay. One theory is that they may have been driven on to land by sharks, after bite marks were found on one of the dead whales. Mr Christophers, from New Zealand's department of conservation, told the BBC that the whales were trying to get round the top of South Island, but if their navigation went wrong they ended up on the beach. In the shallower waters, the animals' use of echo location was impaired. "It's a very difficult place if you get lost in there and you are a whale," he said. Experts say that whales that become beached will send out distress signals attracting other members of their pod, who then also get stranded by a receding tide. Sometimes the whales are simply old, sick, or injured. Andrew Lamason, from New Zealand's department of conservation, said those refloated had been tagged, whereas the latest arrivals were not, indicating that they were a new group. He said 20 whales had been humanely killed by conservation workers as they were in a poor condition. Are whales attempting suicide when they strand themselves? How many whales wash up on UK beaches? Officials have also been looking into how best to dispose of the whale carcasses. Mr Lamason said that simply towing them out to sea could be problematic as they may become gaseous and buoyant and float into populated bays. The latest incident in New Zealand was first reported on Thursday evening, but conditions were too dangerous at the time to launch a rescue operation. New Zealand has one of the highest stranding rates in the world, with about 300 dolphins and whales ending up on beaches every year, according to Project Jonah. Many of these incidents happen at Farewell Spit. In February 2015 about 200 whales beached themselves at the same location, of which at least half died.